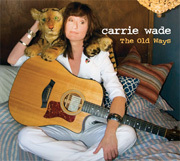 The Los Angeles resident singer-songwriter Carrie Wade surprised friend and foe with her debut album “The Old Ways”. The ten tracks on this CD were written both the music and lyrically entirely by her and together with multi-instrumentalist Peter Kearns and pedal steel player Marty Rifkin they once signed for the production of her first album. She is at home in several markets was there already proven it. The songs on this CD are in folk and country music inspired songs each trying to tell a new story. Handsome broad instrumentation at these numbers gives an extra dimension to a very professional touch is given to “The Old Ways”. We at the listening of this album soon got the impression that several numbers may be considered ripe to be played frequently on contemporary radio stations. The best candidates from the track list for this are “It’s Just Blood”, it soaked with a country twist “Drive”, the swinging country rocker “American Boys” and the beautiful country ballad “In A World That Goes Wrong” which Marty Rifkin’s pedal steel work for the appropriate setting creates atmosphere. 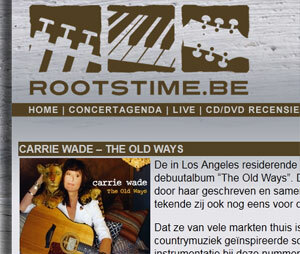 At the end of “The Old Ways” Carrie Wade serves the listener two beautiful songs with the song based on a catchy piano riff “Sublime” and the raft believe pasteurization bier waltzing “Cuddling With Doom”. As a debut album can count and Carrie Wade sets the bar very high for itself with regard to the expectations of the successor where many will look forward to. This entry was posted in Reviews and tagged carrie wade, country, folk, music review, rock, rootstime. Bookmark the permalink.